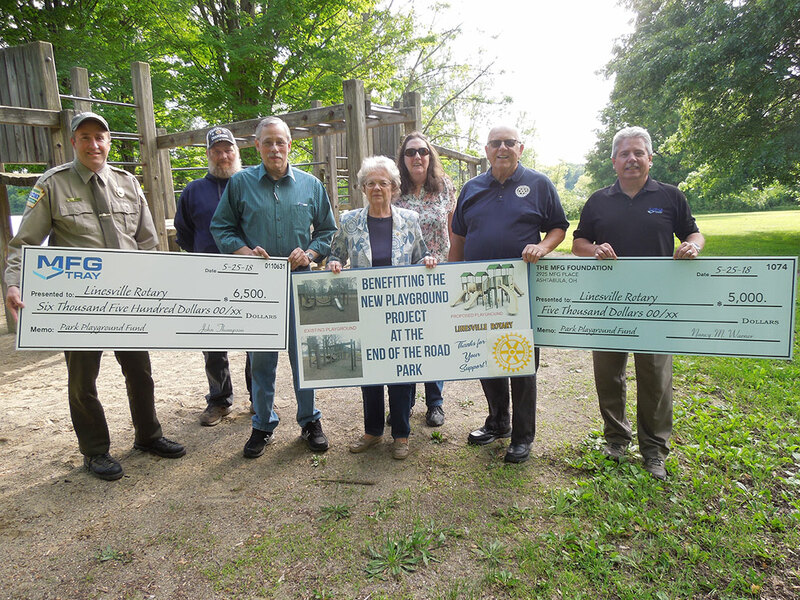 MFG Tray Co. of Linesville and The MFG Foundation of Ashtabula, Ohio, presented on June 6 the Linesville Rotary club with checks totaling $11,500 benefiting the new play ground project at the end of the Road Park in Linesville. The older wooden foundation playground is approximately 15 to 20 years old and the plan is to have the project completed and in place by this fall. The total investment for the playground is estimated at $28,000. Pictured (from left) are Dan Bickel, Pymatuning State Park manager: Bill Vittoria, Linesville Rotary member, John Merry, Linesville Rotary chairman; Norma Thompson, Linesville Rotary president: Janet Arnet, Linesville Rotary member; Don Gill, Linesville Rotary member: and John Thompson, general manager at MFG Tray Co.